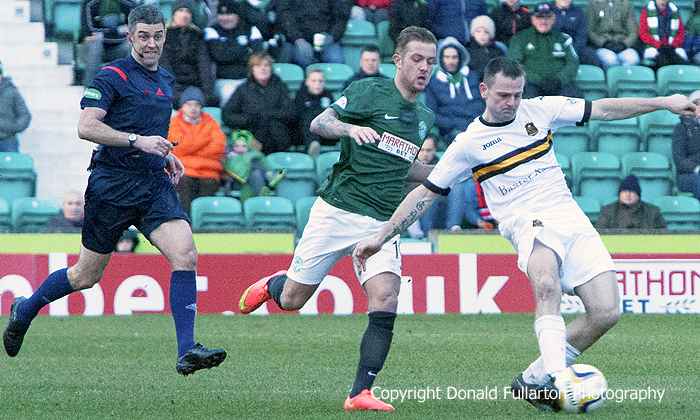 DUMBARTON were outclassed and humiliated by promotion-seeking Hibernian in front of an 8,155 crowd at Easter Road. It was an unhappy return to his old club for Sons manager Ian Murray, who saw his side humbled by the football skills of the full-time Hibs players. Throughout the entire match the visitors struggled to get out of their own half. Their attacks were few and far between, with only two shots at goal in 90 minutes — one wide, the other easily saved. In 2015 they have lost six matches and drawn one, and are close to being drawn into the battle to avoid the play-off spot. One bonus was the brief appearance as a sub of newly signed online striker Chris Duggan on loan from Partick Thistle, but he had little chance to sign. The picture shows Garry Fleming passing infield.